This gingerbread syrup is simple and quick to whip up which makes it the ideal gift to giveaway this holiday season! Perfect edible gift for DIY gifting! Yikes, another sweets recipe? The holiday season has once again taken over and I can’t seem to get my mind to focus on anything else. I feel a little guilty about how sugar-laden VV has been over the past month (I’m not exaggerating. don’t believe me? Look here. and here. and even here). I feel like I’m setting a bad example after I went on that long rant last week to you guys about how switching to a vegetarian lifestyle is a healthy choice. So, I guess, what I’m trying to say is that for every sweets recipe I post on here, there are 10 salads being eaten in the days between which are not getting photographed / recorded. And that being a vegetarian is not an excuse to skip dinner because there is meat in it and jump right into dessert. But… do you know what is an excuse for that? The holidays! And they are here – so why don’t we just indulge for a little longer? Come on – what do you say? Well stuff our faces with fresh lentil soup and kale smoothies come the New Year – I promise! My initial thought when deciding to make this syrup was that I could use dates as the sweetener and do a little bit of healthy twist on it. But I also wanted to make this syrup for far-away friends and I was worried about the dates not being able to travel halfway across the country without spoiling, ya know? What an awful greeting to an old friend – ‘Hey! Here is a package of spoiled baked goods for you! Enjoy! Hope ya don’t get too sick’. It just didn’t seem worth the risk. So, instead, I stuck to the good ‘ole fashion recipe that we’ve been making every year around this time. Silky and sweet – so you only need a few teaspoons. Perfect in your hot cocoa or morning cup of coffee. A great addition to a festive cocktail or to drizzle over baked goods. When deciding that I wanted to make some festive care packages for old friends, I couldn’t think of a more versatile gift. In addition to this syrup, I’m including some homemade vanilla extract (that has been aging for 5 months now), my Sweet & Salty Curry Molasses Popcorn, and Baker Royale’s Cookies & Cream Bark (which was really just an excuse to buy another package of Newman-Os) in the goodies I’m sending to friends. Next up – family packages! 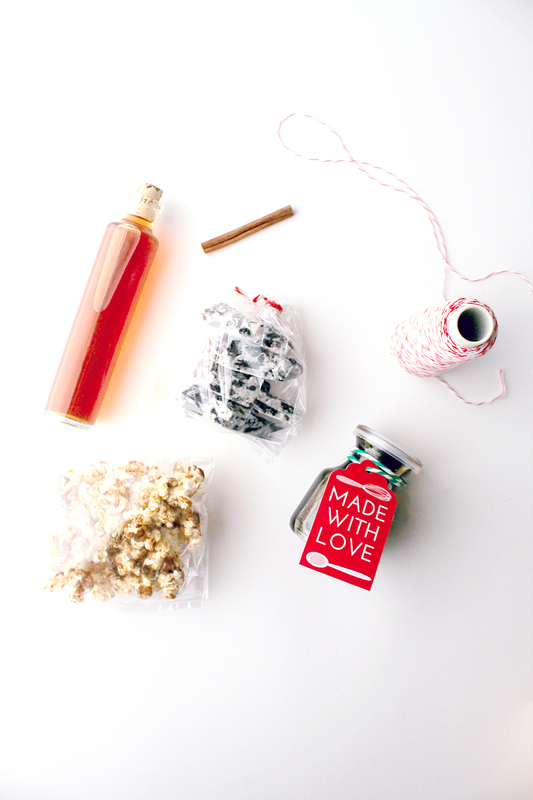 What are you DIY gifting this year? I need some more inspiration! This gingerbread syrup is simple and quick to whip up which makes it the ideal gift to giveaway this holiday season! 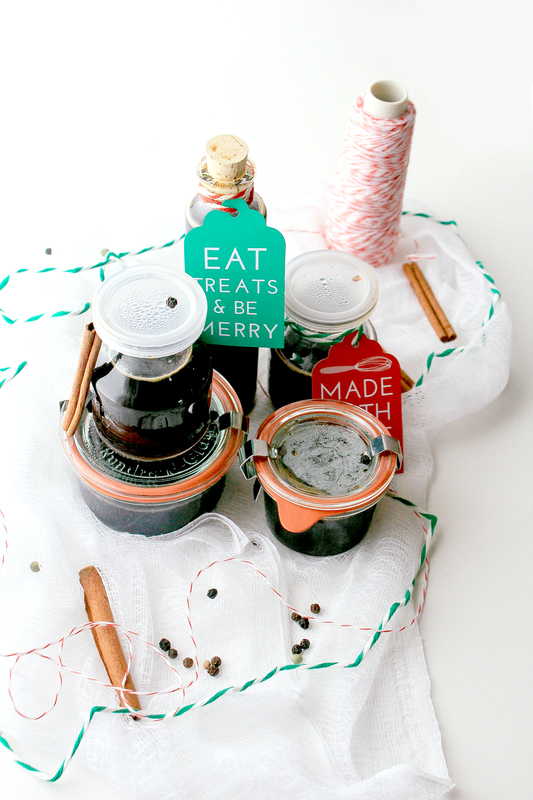 Edible gifts like this syrup are a easy way to let someone knows you care about them! Wrap the cinnamon, cloves, ginger, allspice, and peppercorn in a double lined square cheesecloth. Whisk the molasses, sugar, water, and nutmeg in a small saucepan and bring to a boil over medium. Once boiling, reduce heat to a simmer and let the cheesecloth spices steep in the simmering mixture for 30 to 40 minutes or until a thick mixture is formed. Once thick, remove from heat and let cool. Store in the refrigerator for up to a month and lather over everything sweet. Or gift to all your friends. Previous Post: « On Being Vegetarian + A Giveaway! No such thing as too many sweets. Love the little gift tag! My christmas hampers this year will include basil salt, vanilla essence, lemon sage curd, beer thyme mustard, ketchup, peppermint + pineapple tea…and now this syrup! Thanks for all the inspiration, I love your blog so much and your frequency of posting is terrifyingly good. Oh my! All of those sounds wonderful! Please tell me you will be posting the recipes on your blog soon?! Specifically that lemon sage curd and pineapple tea!! Ah, sadly my dedication to posting frequently is not as staunch as yours, I’ll try my best! What a great gift idea! I love any and everything ginger or gingerbread, especially this time of year. 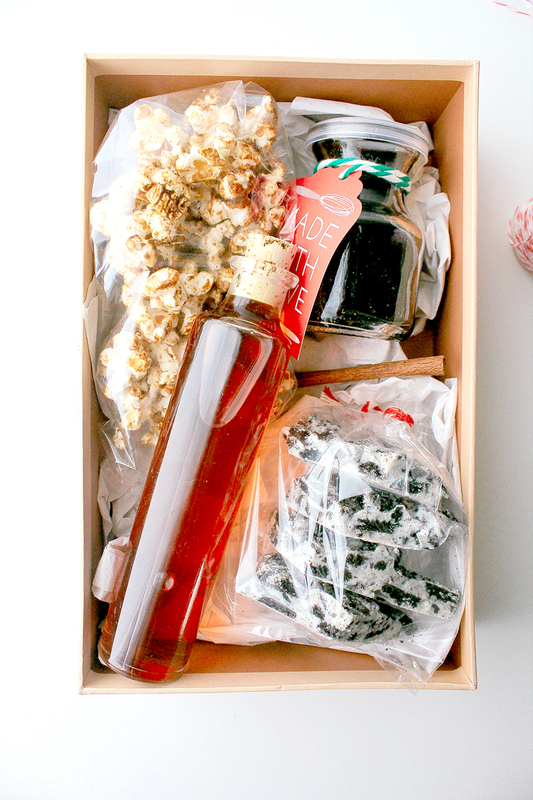 Yes to it all, the spiced syrup, the edible gift, the cute packages – all of it! Oh my goodness this syrup sounds incredible and so easy to make! This year the majority of my family and friends will be receiving a DIY Kitchen gift basket made up of Instant Chai Latte Mix, Vanilla Extract, Flavored Salts and Peanut Butter Chocolate Granola and now this! Love this!!! Would be great to receive, but a wonderful gift-giving idea, too! This looks like such a great gift idea. I made vanilla extract last year which makes for a wonderful (christmas) gift but gingerbread syrup just takes it up a notch. This is great!